Happy New Year everyone! I am back from a two week holiday break, and I am so glad I took two weeks off instead of just one, because I got so sick the day after New Years that I needed another week to recover. All my goals of writing next weeks blog posts went down the drain because the only thing I could do was lay on the couch, binge watch Netflix, and cough up a lung or two. But the plus side is, I caught up on a lot of t.v. shows I've been wanting to see! I am thankful at least that the illness waited until after the holidays were over to arrive. We did have a wonderful ten or more days with family and friends. Our house was filled with love and laughter and I am so grateful to God for giving me such a wonderful nuclear family and close, lifelong friends. I know I normally do my "Grandma and Me" fashion posts the first Monday of every month, but because of the holiday break, I'm breaking my own schedule. I wanted to show you Alethea's and my New Year's outfits. Alethea wore her darling outfit on New Years Day for our annual New Years Day party, and I wore my outfit to church on New Year's Eve day. I have to first explain why my cat Jackson is in the photos. We had always planned on doing the photo shoot in my bedroom because of the colors and the natural light. When we walked into the room we saw Jackson on the bed and thought "Oh, he'll wake up and leave on his own because he is afraid of Alethea". Well, Jackson must have been terribly tired, because he stayed through the entire photo shoot! We thought it was just awesome, because his grey coloring matched everything and we do consider him part of the family, so why not be in the pictures? And the "Love" pillow being in the background was just the icing on the cake. So no, Jackson wasn't planned. It was just a wonderful coincidence that he was in the right place at the right time. At one point Jackson did wake up from his nap a bit and Alethea and him just stared at each other. This was actually the first visit where Alethea recognized Jackson as something other than a stuffed animal. Just look at the expression on Alethea's face! She doesn't know quite what to make of this furry creature. For our New Year's Day Outfits Alethea and I both dressed in black and gold. I wore an old metallic gold sweater from JCPenny (last shown HERE and HERE) with black pants and black wedges. Alethea wore a coordinating tunic and leggings outfit with a metallic geo-print border from Macy's. To accessorize, she added a pretty off-white and gold metallic headband, also from Macy's. Because my metallic gold sweater is already an attention grabber with the shimmer and pretty neckline, I only accessorized with a simple gold and black bracelet and my usual rings. 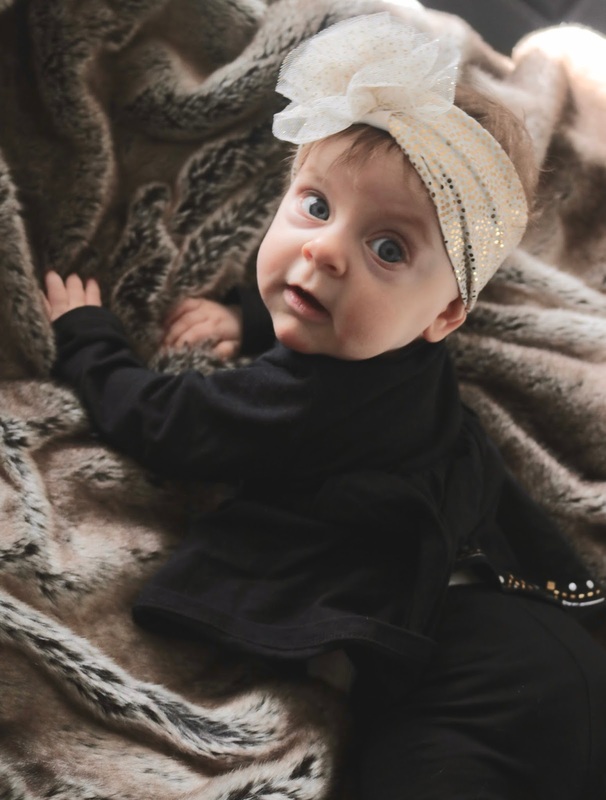 I just love these baby headbands, they add so much to an outfit. And I am so grateful that Alethea leaves them on all day and doesn't try to take them off like a lot of babies do. Isn't this just the cutest picture? I just love her smile! 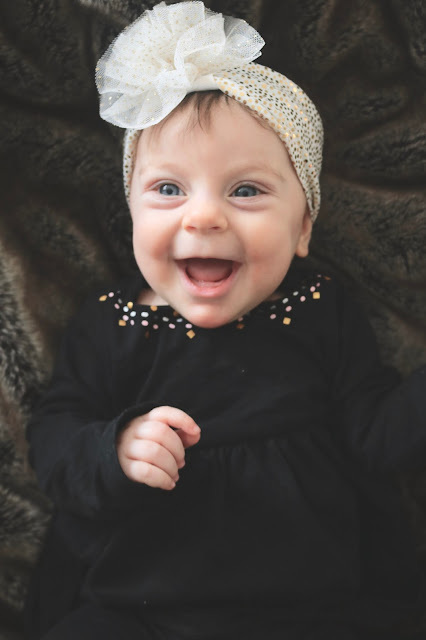 She is such a smiley, good-natured baby now. She smiles at everyone. We got a new DSLR for Christmas, but with all the activity of the holidays and my illness, I have yet to figure out how to use it. However, we were very impressed with these photos just shooting in the Automatic or Portrait mode, indoors, with no special lighting. My dress pants are also old, they are by Worthington. I'm not a fan of buying new clothes just for the holidays. I have four holiday sweaters and I wear them every single year. I just try to vary how I style them so I change it up a little. I just love how Alethea's beautiful big blue eyes pop in every picture. Such a cutie! I'm still so sick as I write this. It's been hard not to get depressed about it. 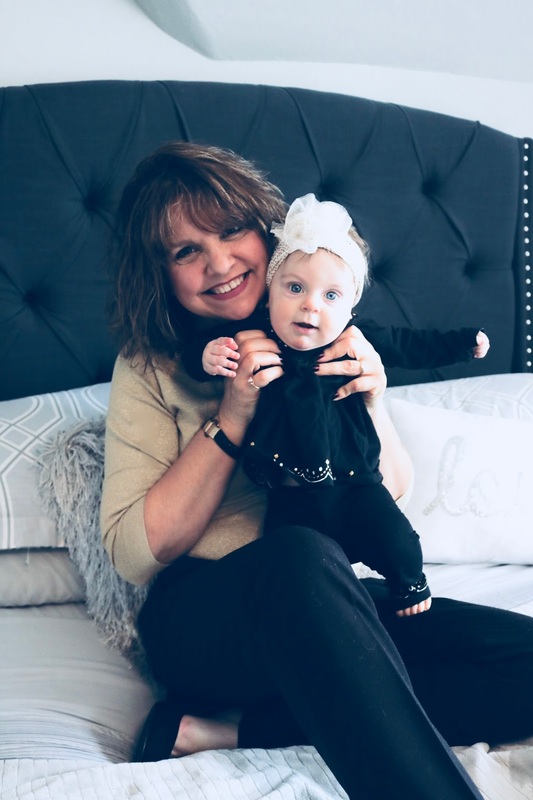 I had so many goals of writing blog posts in advance, taking down the Christmas decorations, and perhaps starting the process of re-decorating my daughter's old room or planning our spring vacation. Instead, I could barely manage to sit up. I hate it when the spirit is willing but the body is weak. I want to keep rolling like the Energizer Bunny, but I can't. But, I can feel myself slowly gettin better and hopefully next week I can at least muster up the energy to take the Christmas decorations down. I hope you all had a wonderful holiday season, and you are feeling well and staying warm in these frigid temperatures! So cute and you're both looking so pretty. 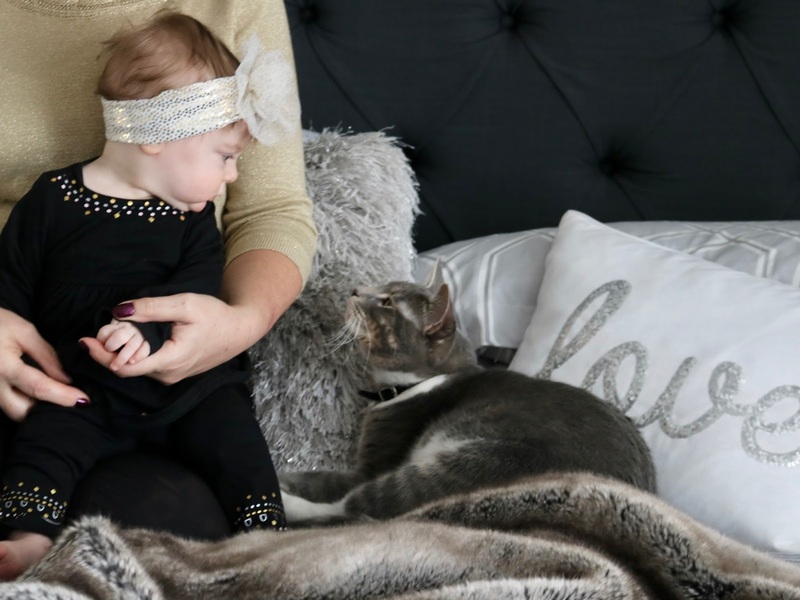 My cat spends his winter days on my bed too and has always had that relationship with my grandkids. He calls them The Noisies, for that is how he sees them! So sorry to hear purposely but your timing is perfect, after the festivities and whilst the blizzards are raging. Stay on that sofa and give your body the chance to heal. I get sinusitis this time every year but this year I got on penicillin earlier and I'm not laid up like last year. Take care of yourself, happy New Year. X. Thanks so much, I am feeling much better. I love what your cat calls the grandkids. I'm sure Jackson feels the same when Alethea arrives. Plus, he's always so jealous of all her toys! Oh, I'm sorry you got sick as well. Yes, doing fashion photos in the winter is quite the challenge. We literally did a 5 minute photo shoot last Sunday. My husband kept saying "You look like your cold! Act natural!" LOL! Yeah, right. Really gorgeous outfits on both of you, that was one of the sweaters I purchased as well and still holding on to it. Like you, I rather not buy too many holiday outfits unless I see something that I absolutely have to have! Oh, thats one of my favorites too! I'm seriously considering printing that one out and framing it! It will be fun to watch these two grow up together. Thanks so much! That gold sweater is a classic. I have a feeling I will be keeping it forever. Oh Amy. She is just a DOLL BABY!!! That very first picture is so adorable. But then I also love the one where she is touching your face. You two are a pair made in heaven. Aww, thank you! You are so sweet! How adorable! I love her little outfit so much! And Jackson is a cutie, too. I'm glad you're feeling better! So cute. You both look very happy! What a nice tradition to have with your granddaughter. Thanks Clearissa! We had so much fun! These are so precious! You will treasure these pictures forever,no doubt! I hate that you are sick. The flu and colds are just rampant this year. My son works in a hospital ER and he said almost everybody that comes in has the flu. Thanks so much Stacey! I just submitted a bunch of these photos last night to put in frames I love them so much. I heard that the flu shot was ineffective this year. I did get one too! These pictures could not be any cuter! Sounds like the perfect holiday. She's going to be SUCH a little heartbreaker when she grows up! 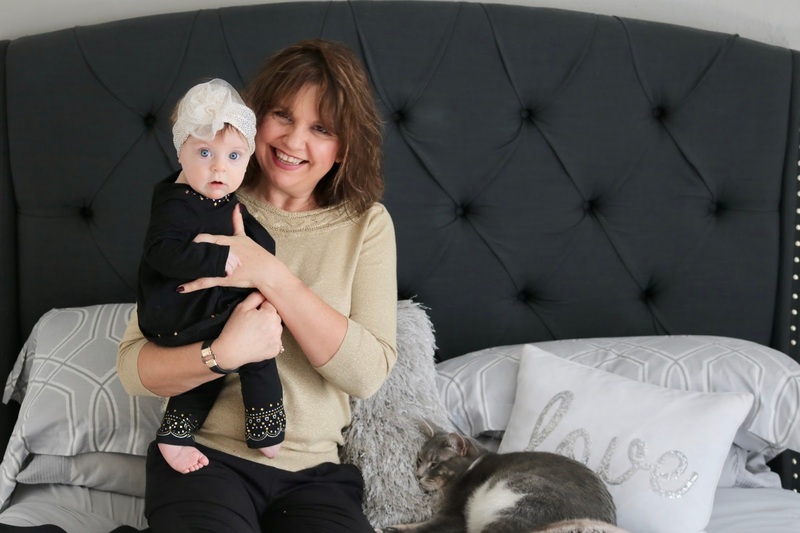 Such gorgeous photos Amy and your little one is so adorable! Grandchildren certainly are the best aren't they. I also have a similar bedhead in the same colour which I love. Thanks so much for sharing with us at #overthemoon and have a beautiful week. Thanks Sue! Yes, Alethea is so much fun! We just renovated our master bedroom last year and it's the only room in the house thats 'in'. LOL! It makes a beautiful room for photography. Thank you! I hope you feel better soon too! So glad to hear you're better! Your little granddaughter is just gorgeous! I love that your kitty is in the pictures. So cute! Thank you so much for sharing and thank you for linking up to #fakeituntilyoumakeit! Such a sweet post and you two are adorable. The love is so obvious...totally sweetness, Amy! 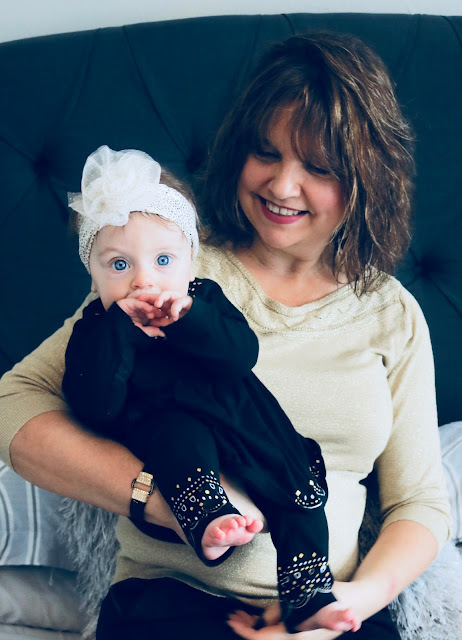 Your granddaughter is such a cutie, Amy! Glad you're on the mend. Sweet friend, I hope by today you are well on the road to recovery but if not, listen to your body and REST. It's such a temptation to try to push through illness but you may relapse so take care of you, first and foremost. What a very special post. Your room was the perfect setting and Jackson, the perfect accessory. Alethea is growing so fast! Seems like you were just sharing her birth story. I appreciate how you restyle your holiday clothes each year rather than buying a bunch of new pieces that you only wear once a year. Your sweater is lovely and the fit of those pants is impeccable. Of course, Alethea is quite the fashionista, too. Happy new year!! Thanks so much, I'm feeling much better though a little sinus stuff is still hanging in there. Yes, Alethea is growing so fast, so I'm trying to soak in every minute of her! ahhh I cant get enough of this cuteness overload! These are precious! How sweet are these photos? Alethea is so precious and Jackson is too! I love the colors and decor in your bedroom, so pretty! Alethea is growing so fast. 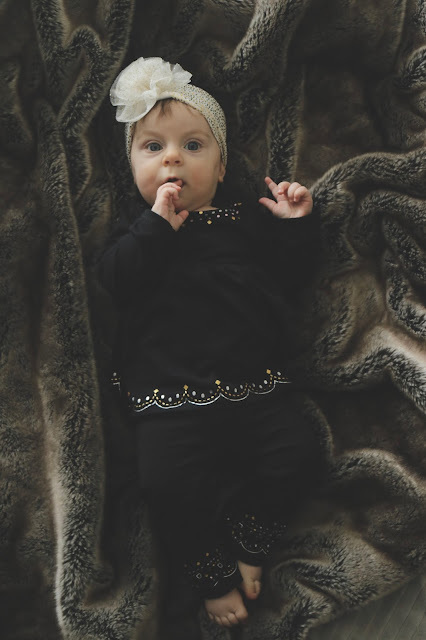 She looks positively adorable and so stylish in her black outfit and beautiful bow! Your bedroom is gorgeous, Amy. I love the colors and how you have decorated. Have you ever shared a tour of this room? Thanks so much Jennie! Yes, I did a whole bunch of posts and even a YouTube video. 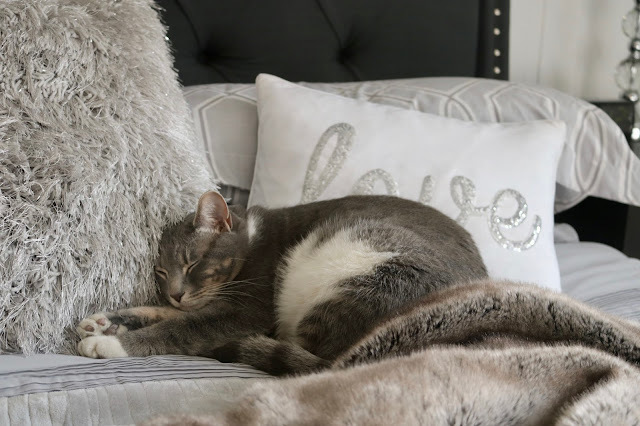 I see you found the Master Bedroom Big Reveal post! It was quite the renovation. Every year I renovate a room in my house. Now that were empty nesters we've been re-working our house to fit our new needs. Two years ago I changed my son's room into a beauty/closet room, similar to what your doing now in your home. This year, it will be my daughter's old bedroom. Happy New Year. Great that you are back in the blogosphere. You always look so cute in your outfits. This time too. Cute cat! Glad to are feeling better, no fun being sick! what adorable pictures, love the little hair hand , very sweet! You both look fantastic! (and so does the cat) I do hope you're feeling better fast! Thanks for sharing with Party in Your PJs!